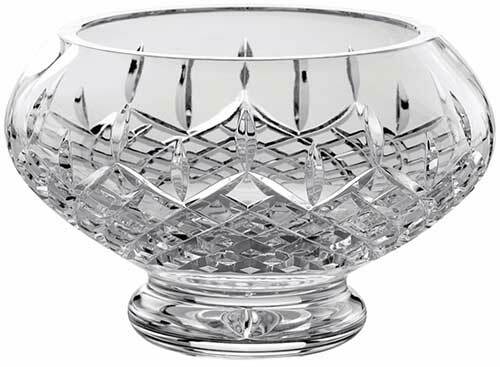 Irish crystal bowl is made by Galway Crystal with the deep cuts of the Longford motif along with a footed base. Longford is the most enduring design from Galway Irish Crystal. This Irish bowl features the cut crystal motif of the Longford pattern. Longford is located in the midlands of Ireland and is the Viking word for long port. The Longford bowl is a footed design that measures 5" tall and is 8" wide at the center. The Galway Crystal bowl is made of 24% leaded crystal; it is gift boxed, complements of The Irish Gift House. Irish bowl is made by Galway Crystal with the deep crystal cuts of the Longford motif. Irish Crystal bowl is enhanced with deep cuts along with an etched Claddagh. Irish bowl is a rose bowl that is made by Galway Irish Crystal with the deep cuts of the Longford motif. Irish bowl is made by Galway Crystal and features the cuts of the Symphony motif.